The period from the mid-1960s to the early 1980s signaled the end of the prosperity of the postwar years enjoyed by the cities of the prairie-those cities located immediately within or adjacent to the Mississippi River drainage system, or what is usually called the American Heartland. During this period, the bottom dropped out of local economies and all collapsed except those upheld by massive state institutions. With this collapse, optimism for new opportunities ended, signaling the close of the American frontier. The Closing of the Metropolitan Frontier looks at mid-sized cities Champaign-Urbana, Decatur, Joliet, Moline, Peoria, Rockford, Rock Island, and Springfield, Illinois; Davenport, Iowa; Duluth, Minnesota; and Pueblo, Colorado. Elazar examines how they adapted to change during the period immediately after World War II, through the Vietnam War, and the Nixon years. He considers the roles of federal and state governments as instruments of change including their efforts to impose new standards and ways of doing business. The Closing of the Metropolitan Frontier analyzes the struggle between federalism and managerialism in the local political arena. 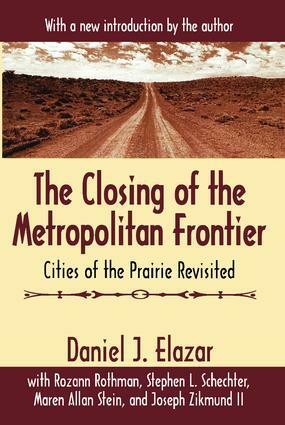 In his new introduction, Daniel J. Elazar discusses this volume's place as part of a forty-year study of the cities of the prairie as well as the changes and developments in that region over that forty-year span. This volume will be of great interest to economists, political scientists, and sociologists interested in the Great Society and the New Federalism and their aftermath.